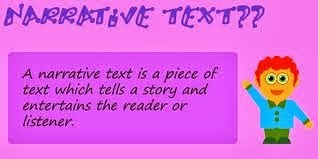 yang tujuanya untuk menghibur seseorang ) jadi narrative text merupakan cerita yang tak sebenarnya. Once upon a time, there was a local ruler named King Sulahkromo. The king had a Prime Minister named Raden Sidopekso. The Prime Minister had a wife named Sri Tanjung. She was so beautiful that the king wanted her to be his wife. One day, the King sent his Prime Minister to a long mission. While the Prime Minister was away, the King tried to get Sri Tanjung. However he failed. He was very angry. Thus, when Sidopekso went back, the King told him that his wife was unfaithful to him. The Prime Minister was very angry with his wife. Sri Tanjung said that it was not true. However, Sidopekso said that he would kill her. He brought her to the river bank. Before he kill her and threw her into the river, she said that her innocence would be proven After Sidopekso killed her, he threw her dead body into the dirty river. The river immediately became clean and began to spread a wonderful fragrance. Sidopekso said, "Banyu...Wangi... Banyuwangi". This means "fragrant water". Banyuwangi was born from the proof of noble and sacred love.